“Does everyone remember what the homework is?” asks History Teacher Leanne Barnes, causing Sophomore Alexis Wright to acknowledge the teacher speaking for the first time during the period. She quickly hides her phone, which was constantly reminding her of her situation at hand. Lexi had been in a back and forth match of harsh words and arguments between her friend and herself. Even as she understands her lack of participation in the class she still inches her way back to her phone, desperately trying to see how her so called friend is defending herself now. What she doesn’t realize is that the Barnes saw Wright on her phone all class and that despite her protests to the contrary, she even though Wright said she did, actually has did not learned understand a thing about the Storming of the Bastille. Besides, this Barnes knows something is up. In high schools drama seems to weave its way into the lives of most high school students and it causes many effects on their daily lives. Many students have found themselves not paying attention in class because of constant notifications on their phone, including Sophomore Taylor Wright. “I was always distracted [in class] by my phone because people would keep filling me in on things that were happening,” says Wright when talking about how it affects her in class when involved in drama. Even when a student might not realize it, teachers might know that something is causing the students not to par. When teachers think that something is affecting students in a negative way they want students to know they can come to them. Neal Onos also mentioned noticing how drama affects the students during class in a similar way noting that, “There are a lot of phones and there is a lot of hall walking, more so than I’ve ever seen”. Since drama is such a frequent theme in high school it leaves students to wonder how it can really affect them. But why does drama start in the first place? How does it actually affect students, including in school, and how can teachers help? Also does drama ever really go away? Drama can be involved in many situations, in romantic relationships, friendships, family relationships, bullying, or it can be between school peers. Overall, it can usually started because of the spread of rumors or gossip. Then why do people feel the need to involve themselves in gossip and possibly even start it? The following information is from an article on www.womenshealthmag.com and wwwbullying.about.com. Gossip can be started by someone when they are feeling self-conscious, if they think more groups will accept them, or if they want more attention focused on them. People can see these reasons as unfair because when people start gossip it is about someone other than themselves. Gossip is actually a form of bullying called relational aggression. Relational aggression is a type of bullying that doesn’t involves physical abuse, but affects people emotionally. A freshman at the school, who wanted to be anonymous in this article, talks about a time when she was the victim of some bullying at the beginning of the school year. “This girl in one of my classes would make faces at me behind my back. And she would point at me secretly and talk about me with her friend,” she said. Other acts of relational aggression include taking part in rumors or gossip, backstabbing people, teasing others, and excluding people. When it comes to drama in romantic relationships, it can occur because of relational aggression, but also for many other reasons. An article found on www.womenshealthmag.com described how sometimes if there is drama in a relationship it will be started on purpose by one of the partners. If they feel a lack of attention in their relationship. When this occurs it could mean people are drawn to other people that create similar situations as before. On www.womenshealthmag.com they conducted an interview with phychologist, Ginger Bercaw. Bercaw had said, “If you’re addicted to drama, you always date the same person”. “I am constantly involved with school drama. You name it, I’ve heard of it,” said Sophomore, Nathan Landis. Drama can happen anywhere and anytime, but it also intervenes a lot in the life of many high school students. After talking to a few students at Innovation, it seems like a lot of drama can occur between friendships, relationships, and even family life outside of school. Giving an example of difficulties with family at home, and IACS student Mariah, whose name has been changed for privacy reasons, “I haven’t been involved in anything at school, but there is a lot happening at home because my parents just recently got divorced and my dad also moved out 2 months ago.” Mariah goes on to explain how it has left her in a weird situation and things do not really feel the same. It is also something that is on her mind when she goes to school, thus effecting her there as well. Many people can relate to having to deal with drama within friendships at school because it is very common. Most of the students interviewed stated how they have either been a victim of or witnessed drama between friends or peers. A freshman girl who wished to be anonymous talks about a time where she witnessed her best friend going through a situation with someone that was really close to her and she could notice how it affected her at school. “She was very upset because she wanted to go to semi with this guy and her family member as well liked that guy. That family member was gonna go to semi with the girl’s crush,”she explained. It was difficult for her friend to deal with the situation and the friend would not even talk to her sister. Landis then brought up a bullying situation he had to deal with regarding other peers at school. “Drama was tossed around about me through my whole life. I had been in the closet about my sexuality. I am very obviously not straight… not meaning for stereotypes, but come on. And everyone knew except for me. I didn’t want it to be true, but I was bisexual and everyone tried telling me and asked me and I always lied in fear of rejection,” said Landis. Facts show that relational aggression can have a large impact and lasting affects on people. Effects that students have to deal with in school from relational aggression can be lack of class participation, finding partners, or masking of focus. It also makes people become secretive and have a decrease in self-esteem. The effects of relational aggression are also similar to the effects of gossip, but they also include depression, thoughts of suicide, health issues, etc. It can also cause students to feel insecure about themselves and their situation. A freshman girl who wished to be anonymous shares a times when she felt this after being in a situation of bullying, “I felt very self-conscious of myself. I didn’t know if she just didn’t like my style or if it was my personality. So I just didn’t want to be in that class anymore”. Since so many students can be impacted in school from drama, some students shared their insights on how it affects them in school. “I was called down to the office once and I was often pulled into conversations about drama and it prevented me from having a clear mindset on school,” said Alexis Wright. Freshman, Emily Magovern brings up a times when she had a friend who was in a relationship with a girl at school, but she broke up with him to go out with his friend. She shares that her friend is now hesitant to trust people in school. Not only can drama be distracting, but it can also put a lot of students in a bad mood during school. Junior, Antonio Cuevas specifically states this, “Usually it [drama] puts me in a bad mood, so I don’t want to bother focusing on my work, since it doesn’t seem nearly as prominent as what’s going on in my life”. While being in a state of irritation, some people can get through it while focusing on their work. Sophomore, Mary O’Flaherty said, “It just made me mad, but it didn’t affect me in school”. Besides bad moods, drama can make people begin to feel down or desolate. “Everything [the drama] just became too much, so I was diagnosed with depression,” said Cardenas. Teacher suspicion is usually present when it comes to a student’s lack of participation in class because they are always trying to help students do their best. For some teachers it is easier to conclude when a student might be involved in drama from the student’s behavior in class. Onos talks about how he notices changes in a student’s behavior when they are involved in drama,including more frequent use of phones and hall wandering. Onos also brings up how a student’s grades can represent situations they are going through. 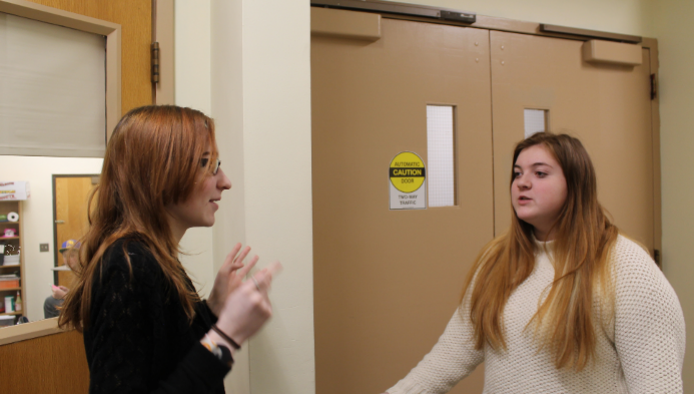 “If it’s not clear to me that a student is affected by drama, often times their grades are affected by it, and often times that results me into inquiring what’s going on,” stated Onos. Teachers might not always know what is going on with a student, but they usually have their suspicions. History teacher, Caitlyn Sullivan also brings up frequent use of cellphones in the classroom and adds that she has witnessed some students mood changes. “Sometimes I have seen students in the halls looking upset and I had one student who said she was feeling very stressed out and asked to go for a walk. But I did not know if these were specifically because of drama,” said Sullivan. When students are involved with drama inside or outside of school there are people in school who they can talk to. Onos reinforces this idea that students should turn to teachers for advice if they are dealing with stressful situations because students don’t really know just how much drama can affect them. When students gossip and mention drama in class, Onos notices that he can make assumptions about some situations from what he has heard in classes in the past. “They don’t make it obvious, but being that I strive to have good relationships with my students, I’m often able to figure out what they’re referring to even if they don’t refer to it specifically,” concludes Onos. Drama can have long lasting impacts on people. For some, drama just seems to stay with you even as people continue on with their lives. “It [drama] always sticks with me sadly,” said Taylor Wright. Sophomore Holly Lee agrees, “I feel like we can never cut out drama fully from our lives and that drama will always stick with us because wherever you go, there will also be drama”. Also Mariah brings up how she will have certain times when she remembers being bullied. “The bullying I got affected me a lot because I still get flashbacks from and I’m always scared that someone is going to hate me. Also when I have to present, I get a lot of anxiety and I freak out because I always remember my bully judging me,” said Mariah. While some people cannot seem to lose the drama they have had to deal with, other’s can seem to forget it. “Eventually the drama died down, so I just went on with my life,” said Alexis Wright. Cuevas said something similar, “I just let it simmer over until people could talk it out, and forgave and forgot”. Drama can have a lasting effect on people or it could not, it just depends on who who someone is. Next Next post: Project or Test?